If you love to perform, and you imagine your name in lights on Broadway, then you’ll need the skills to get you there! The Patel Conservatory is offering Dance for Musical Theater summer camp to help students interested in musical theater gain the necessary dance skills. During this week-long camp, students in grades two through eight will explore the different forms of dance used in American musical theater including tap, stylized jazz and contemporary ballet. “The students will be broken into groups according to their skill levels, and each group will learn a musical theater jazz piece to popular Broadway tunes,” explained Downey, a former Broadway performer herself. 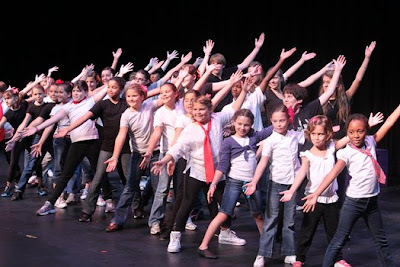 The camp will culminate in a performance in which the students get to show off choreography learned throughout the week to songs such as Footloose, Can-Can, Trash in the Camp from Tarzan and Nicest Kids in Town from Hairspray. “It’s all dance all day for an entire week. Then they get to perform in the Straz Center’s Jaeb Theater. It’s going to be a week of high energy that will be a lot of fun!” said Downey. Dance for Musical Theater will be Monday through Friday, July 15 to 19 from 9 a.m. to 4 p.m.
For information or to register, please call 813-222-1002.